What is your Why? The key to getting things done. It doesn’t matter if it’s your personal or business life. Your why will get you up in the morning, get you to the tough meetings, finish off those uncomfortable tasks and keep you going when you feel like you must rest. What is it you want this business to do for you? What are you willing to do to get this? Remember, you are in business. Success will not fall into your lap. You will have to work for it. That sounds harsh, but it’s a harsh lesson we’ve learned over time. On the positive side, you’ll have to work hard for a few years but residual income is not like getting paid an income. Not everyone has the same amount of time to spend. Whether its stolen time in 15-minute batches or 4 hours a day like Della and I a virtual franchise is a wonderful choice. The next step is to link your Why to your Goals. It takes some digging to get to your true why. It takes some digging and I expect it will be emotional when you find you’re true why. Start by asking yourself What is important to you about having a successful business? Then based on that answer continue down 7 levels. Your why will evolve over time. 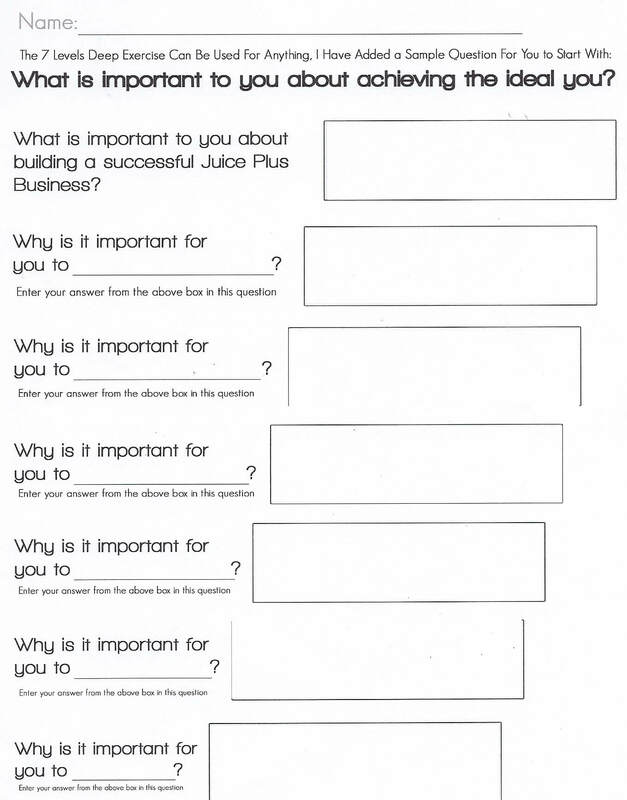 Ours has from simply wanting to improve our own health to telling other people about this amazing business, helping them to improve their health and their finances. Let me know if you want these forms, I’ll gladly send you copies. The first few minutes of the “Find your Why” video are TD Jakes Run video. Consequently, the “Find your Why” video below starts at 6:30.